On the website of NASA, one can see that the continents are moving. The continental movement seems to be somewhat stable today. Continental movement is assumed to have been stable throughout the past within the standard interpretation of subduction theory. One indication that there is something wrong with that assumption is that the current directions in which the continents are moving are off. They are not in the direction that (according to reconstructions) they used to be, nor are they perpendicular to Mid-oceanic ridges. Europe should be moving eastward, but it is moving northeast. South America should be moving to the west, but it is moving to the north. Indonesia should be moving south, but it is moving westward. The current moving directions are not the same as what they used to be. Also, continental breakup is not explained within the standard theory. On the page “breaking a planets crust” is shown that this could very well be related to impacts. The force required to break a planets crust could be so much that it may also be responsible for continental movement. Rapid movement of a planets crust (Catastrophic plate tectonics) is possible and well documented. But how this is triggered is not well understood. Again, craters may be the answer. 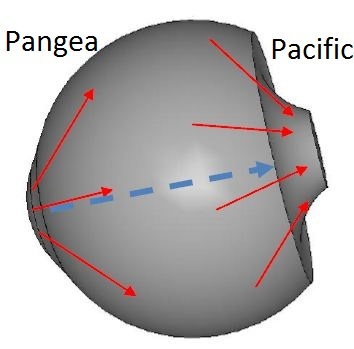 As said in the previous page, large impact craters may cause runaway subduction, because deep impact melt in combination with crossover depth may cause the melt to go down in stead of up. Another issue is that the shape of the earth may have become unstable because of a one sided meteor bombardment. This unstable shape collapses, causing large pieces of the crust to move. See image below. Unstable shape of the earth causes the crust to move. Note: this image is very exaggerated for illustration purposes. Some parts of the earth seem to have formed spirals. This is especially the case for the parts that surround Australia. See the image below. All the spirals are in the continental crust. One explanation could be that the bombardment would have made large craters in the earth that has closed up, making the continental crust to have acted as toothpaste. This toothpaste like flow, combined with Coriolis effect could have caused the spiral shapes. Whether or not this is possible needs to be investigated. This area also has holes in the continental crust (see image below). How is subduction supposed to form holes? Impacts seem more likely. Plate tectonics theory seems insufficient for a lot of issues, but more research is required for this alternative. Earth’s crust types. Gray is continental crust, colored is oceanic crust. Note that the map has interpretations written on it. The colors show the radioactive isotope ratios, which are interpreted as age. Especially the crust between New Zealand and Australia seems completely crumpled. 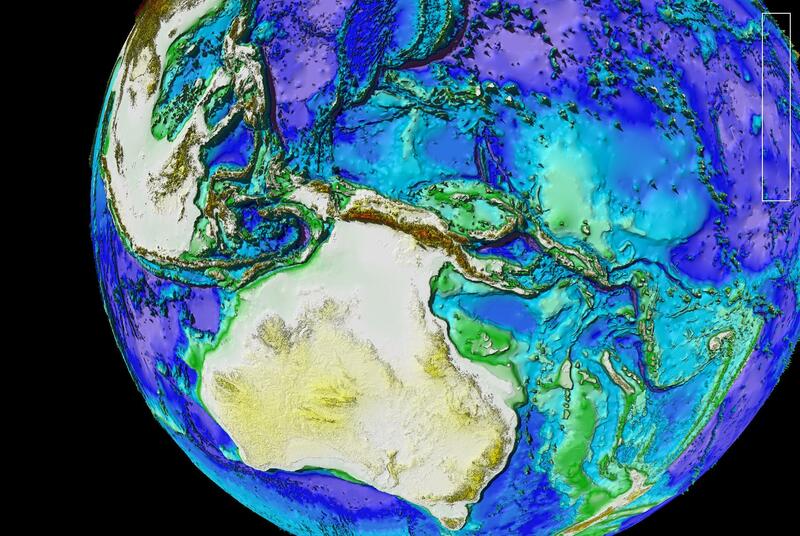 Could it have been that the earth has once been completely covered in continental crust?